Shad explores the power of walk-up music with CBC's Sonali Karnick and former Our Lady Peace drummer Jeremy Taggart. What's in a walk-up song? As a baseball player struts up to bat, a good song blaring over stadium speakers can really pump up both the athlete and the crowd. But a bad tune can do the exact opposite. 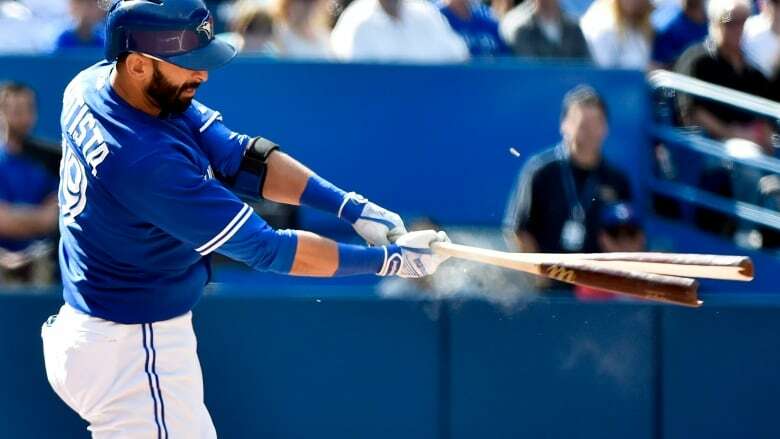 As the Toronto Blue Jays head into today's crucial game against the Texas Rangers, Shad explores the power of walk-up music with Sonali Karnick of CBC Sports and former Our Lady Peace drummer Jeremy Taggart. What does a player's song say about him? How does music figure into a winning team's strategy? WEB EXTRA | ​Q-niverse, after this segment we asked: what's your walk-up song and why? Listen below to see which audience members we brought up to bat. Brian Coulton with Björk, Army of Me. "Obviously." Fabiola Carletti with Major Lazer, Watch Out For This. "Pull up! Pull up!" Mitch Pollock with Bon Jovi, Bed of Roses "I want to stun the pitcher with the smooth guitar of Richie Sambora and then blast a dinger." Diane Eros with M.I.A., Bad Girls "I can't help it." Sonya Bell with Selena Gomez, Like a Champion "If it's good enough for Hillary Clinton, it's good enough for me." Chris Berube with Sonic Youth, Kool Thing "Realistically, it wouldn't be played at a baseball stadium." Stuart MacLean with U.N.K.L.E, Restless "I was tempted to say The Chemical Brothers, Block Rockin' Beats, but I swear that someone in the MLB has that already."